The southern island of Phu Quoc is luring a wave of investment as developers and international hoteliers are speeding up construction of large-scale resorts in anticipation of a tourism boom. Most of the country’s major real estate developers such as Vingroup, Sun Group, BIM Group and Nam Cuong Corporation have secured footholds on the island which is just a 45-minute flight from Ho Chi Minh City. Phu Quoc has also appeared on the radar screen of international hotel operators with Accor and InterContinental Hotels Group having secured contracts to run soon-to-open hotels. Other brands such as Ritz Carlton and Hyatt Regency have also set their sights on the island. 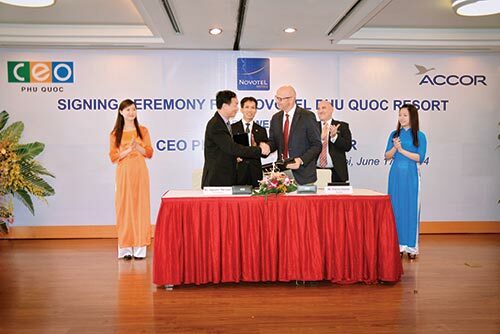 Last week, Accor, which is now the biggest international hotel operator in Vietnam with 17 properties across the country, inked a deal with CEO Phu Quoc Company to provide technical assistance and management for the Novotel Phu Quoc Resort. Once it opens late next year, Novotel Phu Quoc will become the second biggest hotel in operation on the island with 406 rooms and 40 bungalows. Patrick Basset, Accor vice president for Vietnam, Thailand and several Asian countries, claimed that although Phu Quoc remained a hidden gem, the island looked set to become a hot tourism destination after Phuket and Bali. Basset said Phuket (in Thailand) and Bali (in Indonesia) were well established tourism hotspots and Phu Quoc would follow as all three islands had similar assets. He said Phu Quoc remained almost untouched but was ideally situated with Bangkok and Singapore just one or two hours away. The island also boasted beautiful beaches and mountains. Doan Van Binh, chairman of CEO Group, the owner of CEO Phu Quoc, said the Novotel Phu Quoc Resort would kick-start of the company’s ambitious investment into the island. Novotel Phu Quoc Resort is part of the $200 million Sonasea Villas & Resort complex that covers 80 hectares. The CEO Group is set to develop three projects on the island, including the 150-hectare Sonasea Golf Estates and the 62-hectare Sonasea Residences. The development plans for the latter two have not been unveiled. “We have so far focused our real estate investment in Hanoi, but Phu Quoc will become the next destination where we see great potential for success,” said Binh. With three projects in hand, CEO Group has become the top three biggest developers on the island. The others include Vingroup, which is building a 750-room hotel and 30 villas north of the island. The hotel, which is expected to open on November 1 will become the biggest property on the island. The company is also developing “another Vinpearl Land” based on their resort in Nha Trang with entertainment park, aquarium and a 27-hole golf course. BIM Group is another major developer on the island and it is building a hotel complex with 400 hotel rooms, 88 apartments and 5 villas to be operated under the InterContinental Hotels Group’s Crowne Plaza brand. Mauro Gasparotti, executive director of Alternaty real estate consulting company, claimed Phu Quoc has always been a very attractive investment destination due to the natural beauty of the island and strategic location within South East Asia. “In the past there have been several constraints to the development of the island including the limited capacity of the airport. This has long caused difficulties for MICE business and tour operators for accommodating larger groups,” he said. Other factors hindering the island’s tourism development include limited accommodtion resulting from the lack of infrastructure, as well as high construction and operating costs. In the past, power on the island was fuelled by diesel generators which meant electricity costs were some of the highest in the country. “Fortunately, the recent opening of the new international airport as well as the completion of several infrastructure projects have made Phu Quoc a more attractive destination for hospitality investment, and as a result several projects are now taking shape,” Gasparotti added. A power line connecting the island with the main land was put into operation last year, helping reduce electricity costs and fuelling a new round of hotel construction boom. Phu Quoc, which has the same size as Singapore, is now home to a number of small hotels such as the Chen Sea and La Veranda. Binh from CEO Group said the lack of hotel rooms had led to room rates skyrocketing over the last few years as demand spiralled up, especially following the launch of chartered flights from Russia to Phu Quoc.